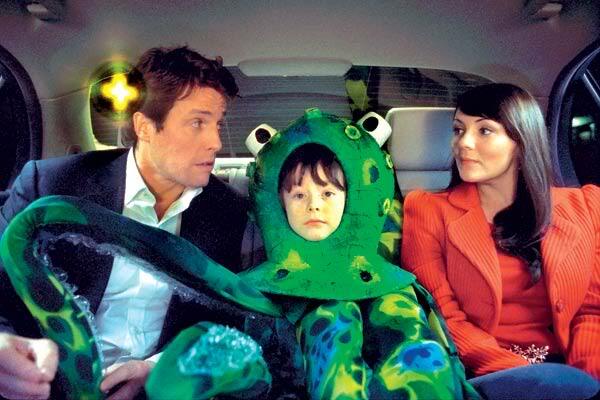 I am making an octopus outfit for my grandson, and a couple of commentators mentioned the film Love Actually. I don’t want to make you late for the concert. No, it’s nothing, really. – Keith’ll be very disappointed. No, really, it doesn’t matter. – The octopus costume’s taken me months. I haven’t watched this film, but clearly, judging from the photograph, it is looks hilarious. Here is my inspiration picture – thankfully relatively tasteful. 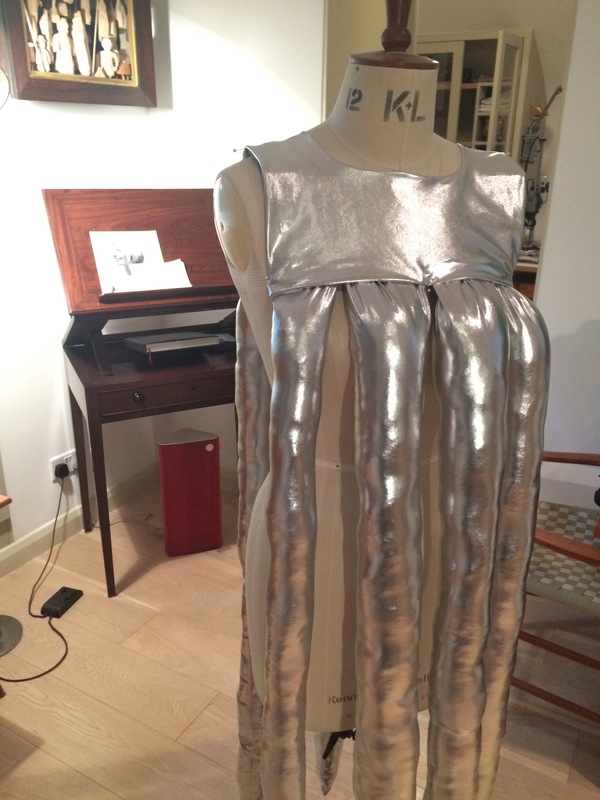 From two metres of plasticised silver jersey Esme cut out eight legs – quite fat ones. I stitched them up on the overlocker in about 15 minutes one morning. Esme stuffed the legs with some fluffy stuff, made from recycled plastic bottles. Using one of Ted’s T shirts as I guide I cut out a yoke, a matching facing, and used some iron-on interfacing in the hope that the yoke would support the weight of the legs. I put elastic sides in to hold the front and back together. Then I attached the legs and finished the edges. The whole thing seemed huge, and heavy. I think the legs on the boy, above, were much slimmer. But hey – this is a big octopus. Maybe Ted will love the outfit so much he will wear it every birthday until his 21st. Certainly Gus (my son) delighted in trying it on. I did too. The cat enjoyed playing with the tentacles. If fact the legs can be knotted, woven and tucked to create a wide variety of looks. Eight is a lot of legs. I may have mentioned that I was thinking of a hood. 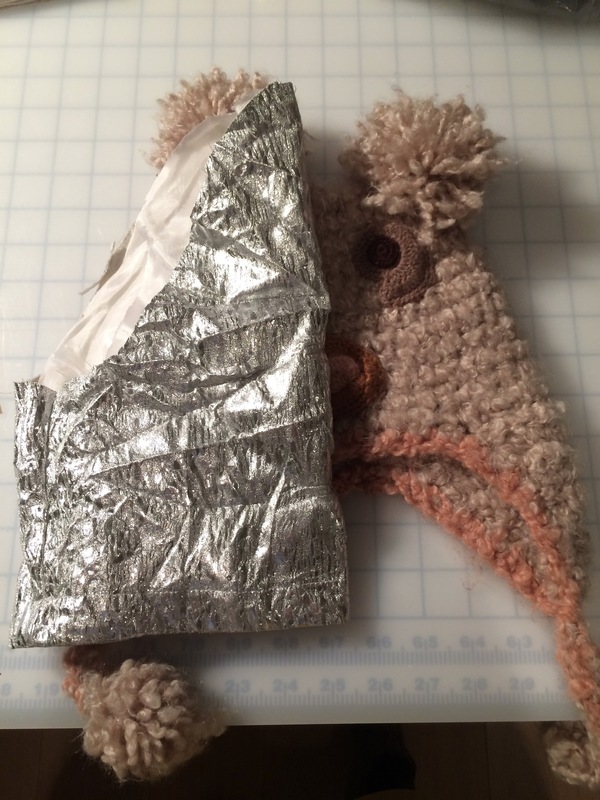 In fact Ted offered me a wooly hat as a pattern, so I changed the plan. I remembered I had two cut off sleeves from a silver top I got in the Topshop sale. 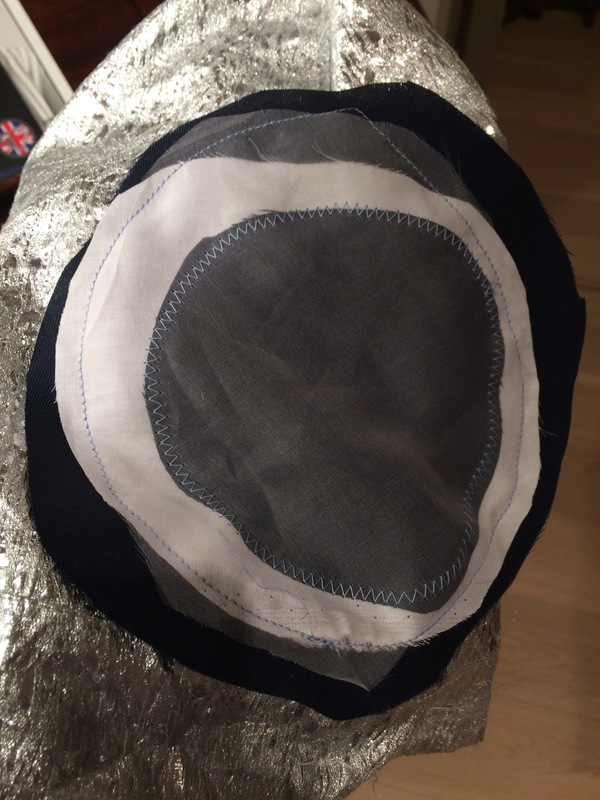 I unpicked the sleeves, drew around the hat and overlocked the two pieces together. For eyes I did a bit of applique, using scraps of navy silk, white blouse fabric, bits of organza and a zigzag stitch. It didn’t take me months. In fact it only took me a few hours, and it was good fun. I got quite confident with the fabric and fancy making something for myself in it. Manipulating the outfit once it had eight stuffed legs attatched was somewhat challenging, but I shoved them through the machine, and had them round my neck, in my lap, and spewing over the chair, as I sewed the seams down. Phew. Anyway I will post some pictures of the Under the Sea party next week. Esme is making a goldfish outfit for Ted’s little brother. Nick is cooking fish pie, and a cake. I did briefly think of making something special to wear myself, but I am not completely mad. Who needs those Burda February editions? Huge fun! 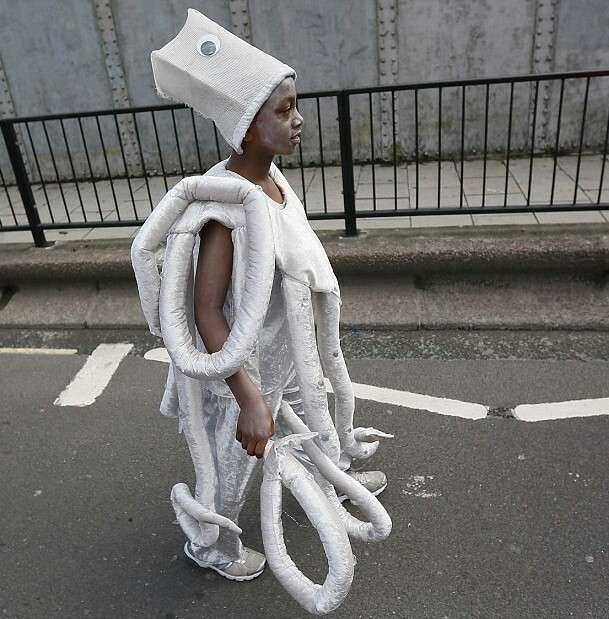 I’m not in the market for an Octopus costume right now, but when I am, I will know exactly where to come. Oh, and the circle skirt dress in previous post is just fabulous! Brilliant! Can’t wait to see this in action. Too bad there are no photos of you with the octopus arms over your head. Can’t wait for the pictures. Great fun! This is great but that eye is disturbing. Can’t wait to see Ted modelling it, you done good. Making costumes can jiggle the brain into some very creative places…love it and I also wish you had photos of the 8 arms hanging on you during construction. Thank you for sharing such a cool project! Next year, the Third Lobster! Fabulous! I recommend watching the film just before Christmas – whilst not essential it is festive. Reminds me of something from an Ed Wood movie (that’s a compliment!) Hope you all enjoyed the party! Oh you missed your opportunity to make yourself a mermaid or siren costume! 🙂 Then again, it was a children’s party. Hope it was as fun as it sounds. I’m looking forward to seeing the goldfish outfit, too.